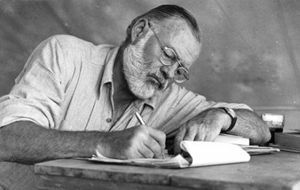 The Hemingway App promises to make your writing bold and clear. How does it do that? Most writers today strive to avoid the passive voice. Do you know what I mean by passive? Don’t be too quick to say yes! It may be easy to identify the blatantly obvious cases — “mistakes were made,” a feeling expressed by Ronald Reagan during the Iran-Contra scandal. But it’s hard to spot the more subtle variants. I find it particularly telling that both George Orwell and E.B. White (whom I admire deeply) both decried the passive and yet used it frequently. For example, “The passive voice is wherever possible used in preference to the active,” Orwell wrote, passively. Ironic, no? That said, I do regret it when many writers lapse into wordy, complex (and sometimes passive) sentences that make it difficult for readers to create visual images. But I’m not going to suggest you go back to school for remedial grammar. I have a much simpler suggestion. Use a free piece of software called the Hemingway App. Simply click on the “write” button (top right-hand corner) and write or paste your text. Then, when you’ve done that, click on the “edit” button (also top right-hand). The single best thing about this software is that it will highlight all your passive construction in bright green. Easy peasy. I double-checked some of the sentences Pullum had identified as active (ie: not passive) and the software did not misidentify any of them. But it did fail to catch a couple he had ID’d as passive. That said, I could see the Hemingway App had diligently earmarked hard-to-read and very-hard-to-read sentences. What I lost on the swing I could gain on the ‘round-about, I figured. But, mainly, I encourage you to take the app for a test drive. Me? I’m vacillating between my old readability stats and the newer Hemingway App. For a while, I’m going to use both. On a separate topic, if you’ve been thinking about buying my popular book, 8½ Steps to Writing Faster, Better, this is an early heads up that the price will rise on April 16. If you’re interested, be sure to get it before that date. Note that shipping is currently free anywhere in the world. What do you think of the passive voice? Do you try to avoid it or do you find yourself drowning in it? We can all help each other so please share your thoughts with my readers and me. If you comment on my blog by April 30, 2014 I’ll put your name in a draw for a copy of the autobiography Open by Andre Agassi. (I’m not even interested in tennis and I loved this book!) If you don’t see the comments box, click here and then scroll to the end.